In May, the Seattle Community College District implemented time restraints on campus use prohibiting anyone to be on district property from 10PM to 6AM leading to groans and protests. 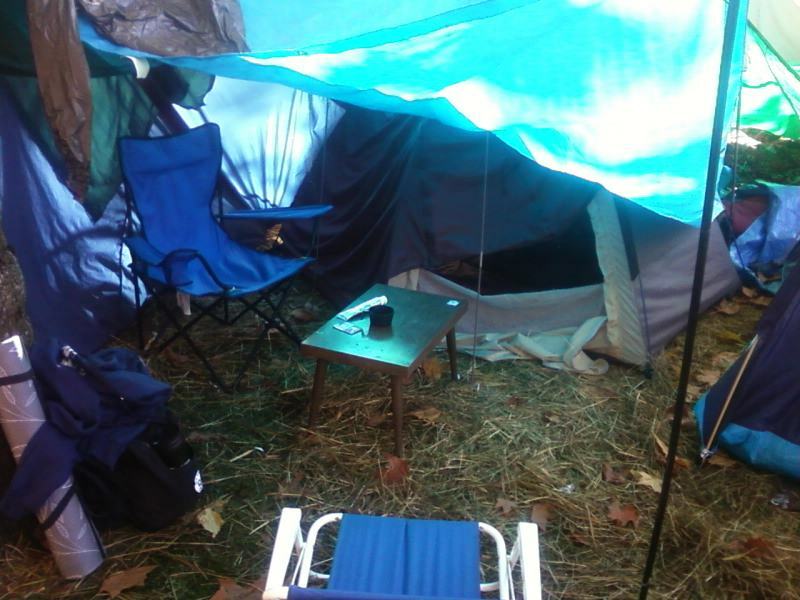 Well occupiers rejoice, a recent internal document says the district plans to flip the switch and get rid of the time restraints and even allow camping in the district. New City Collegian received 63 district documents from the First Amendment Taskforce which was charged with examining the controversially passed time restraints. Most of the documents are filled with large black redacted lines but one announces the districts plans to alter the WAC code substantially. The document addresses many legal issues pointed out in a NCC Editorial which was later syndicated to the Occupy Seattle website. 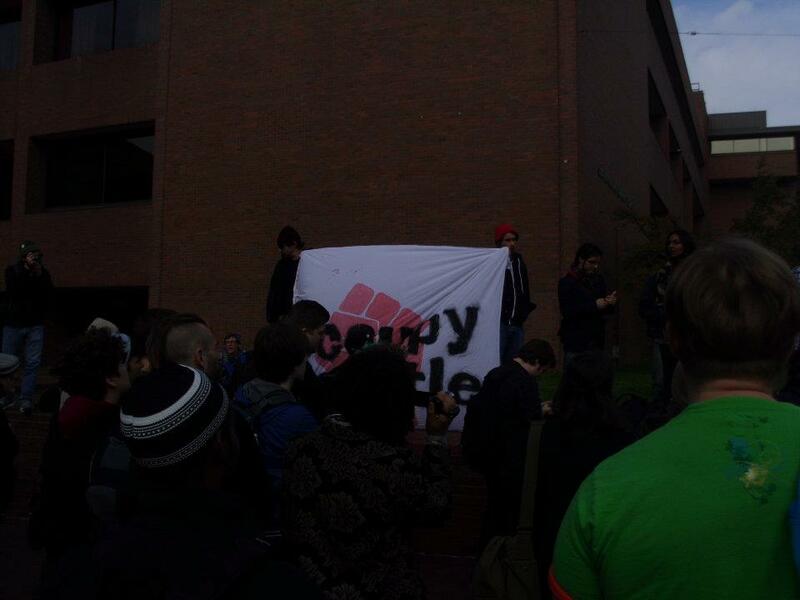 -First Amendment activities will be allowed at Seattle Central Community College 24/7. Time restrictions will remain in place at South and North Seattle campuses from 10PM to 6AM. SCCC is the exception to the rule because of its “urban setting” says the document. -College facilities MAY be used for “commercial sales, solicitations, advertisting, or promotional activities” if they serve an “educational purpose” are sponsored by a college department or campus club. This too addresses a point made in the NCC Editorial, “This section has already been compromised by the college as Balagan (a private nonprofit theatre company) operates The Erickson Theatre. Erickson was originally funded by private donors for the purpose of Seattle Central students. I am not sure what defines the “In general” but this section needs to be completely overhauled.” Overhauled indeed. In order to implement these rules the district will have to undergo a formal process as it will effectively reverse state law. It is unclear if this is the final word from the group but they recently convened the taskforce in early December and Chancellor Jill Wakefield in a stroke of wit, “Want(s) to make sure I have a new year filled with controversy, demonstration, marches, etc,” says one of the emails that was not fully redacted. Community input outside of taskforce members was not allowed at the meetings. New City Collegian reporters and outside community members were barred from attending taskforce meetings being told by the district that it does not fall under the “Washington Open Meetings Act.” The school has failed to cite definitions in the WOMA that apply to the group. This is not the only strange move the district has made in relation to campus use. The colleges have a practice of allowing non-students to come onto campus to engage in First Amendment activities. WAC 132F-136 is not worded broadly enough to bar non-students from accessing the campus to picket, collect signatures, hand out leaflets, or engage in other speech. 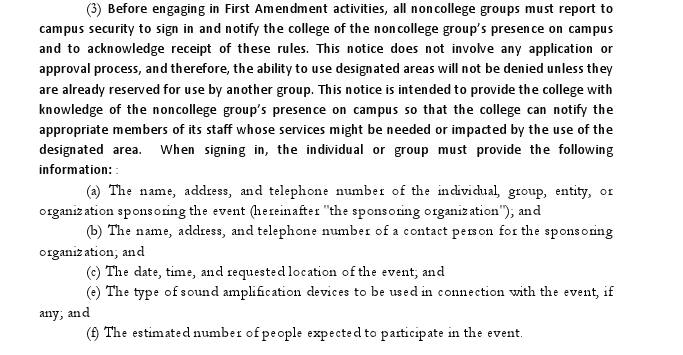 See WAC 132F-136-050 (trespass), which by implication acknowledges that non-students are allowed on campus. Also, while the policies generally do not allow for rental of facilities by non-students, each campus rents it facilities. Once you open up this forum, the College cannot discriminate based on the viewpoint of the organization that wishes to rent facilities (e.g., religious groups, political groups, etc). Don’t start packing your camping gear and your revolution quite yet, the rules are subject to change and will likely be a while before they are implemented. However, the recently announced plans for the campus will definitely play well for the upcoming Puget Sound Anarchist event to be held on campus tomorrow at 11pm, though I doubt Anarchists will sign up with security. ← Seattle Snow Sludge Getting You Down? Why Not Visit Italy!